Will Prince Fielders’ Exit out of Milwaukee Be Comparable to LeBron James’? If there’s one thing Brewers fans have learned over the course of this marvelous 2011 regular season, it’s that Prince Fielder’s inevitable exit will sting. A lot. Assuming Fielder’s ill-timed comments in an interview with TBS earlier this month prove to be valid, Milwaukee natives must live with the fact that they will be without their star-studded first baseman for the foreseeable future — for better or worse. Wait a minute…doesn’t this sound eerily familiar? It does, as a matter of fact. One could make the argument Fielder’s stay in Milwaukee is comparable to that of LeBron James’ in Cleveland. James, whose rookie season came all the way back in the 2003-04 season with the Cavaliers, stood pat in Cleveland for seven full seasons until his rookie contract dissipated at the end of his 2009-10 campaign. He then, as we all know well-and-full, took to the free-agent market. Amid the persisting speculation and controversy, James decided to (literally) air a live show on ESPN, declaring once and for all where he would “take his talents” for what would presumably be the remainder of his historic career. While I can’t say Fielder will hold a live press conference announcing where he plans to play for the next decade, I can say this: the loss of Fielder, no matter how likely or unlikely it may be at this juncture, will be catastrophic for the city of Milwaukee. What No.28 has been able to accomplish over his six full years as a Brewer (.281 BA, 226 HR, 648 RBI, .536 SLG, .924 OPS) will never again be replicated — just like that of James’ stay (40.1 MPG, 27.7 PPG, .328 3P%) in Cleveland. Sure, Fielder has (through last season) never successfully won an MVP award like that of James. But, statistics aside, Fielder is every bit as valuable to the city of Milwaukee as James was to the city of Cleveland, and his departure will be treated as such. Here’s to the hope that Milwaukee doesn’t burn Fielder’s jersey after he cashes in this winter. Prince Fielder’s untimely comments have officially been blown out of proportion, not to the surprise of Milwaukee Brewers fans. The fact that Fielder would bring up such a sensitive topic when his own team is in the midst of a deeply competitive pennant race won’t bode well with Brewers fans, either. Will his comments derail what was once a steamrolling Milwaukee ballclub off the path of success? 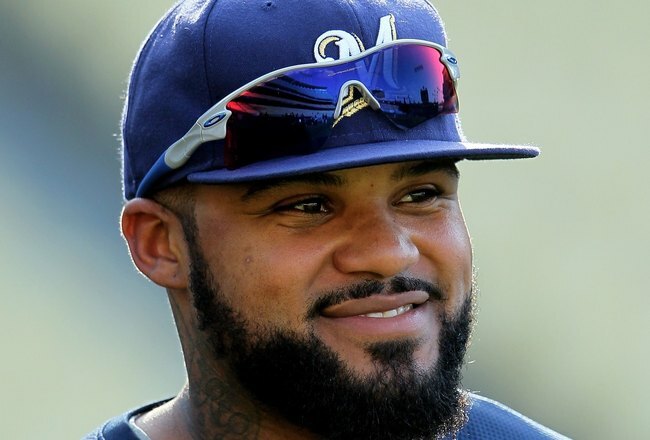 Is there still an outside chance of Fielder resigning with the Brewers in 2012? Is he still a vegetarian? These are all merely insignificant topics for discussion at this point. Maybe I’m simply speaking out of utter disgust, but here are six reasons the Brewers are better off without Fielder in 2012. Okay, so it was cool the first 200 times. Now it’s just straight up uncalled for. The MLB winter meetings were extremely kind to the Milwaukee Brewers last year. They were able to acquire Zack Greinke and Shaun Marcum, among others, to bolster a lagging starting rotation, despite Fielder’s already massive $15.5 million 2011 salary. What GM Doug Melvin plans to do this offseason will be uncertain at best. That being said, without Fielder’s contract eating up roughly 20 percent of Milwaukee’s payroll, Melvin will (finally) have the opportunity to test a promising free agent market and/or trade for any number of quality, cost-effective players. The 26-year-old Gamel was one of the few top-notch prospects the Brewers didn’t deal away in acquiring Greinke or Marcum last offseason. Since being drafted by Milwaukee back in 2005, he has worked his way up through the minors while making a few forgettable MLB appearances along the way. However, don’t let a few meaningless major-league at-bats get you down. Gamel has tremendous power, accumulating 28 HR, 96 RBI with a .942 OPS in 2011 alone, and will fill the left-handed void in Ron Roenicke’s lineup once Fielder is out the door. Gamel has arguably been one of the most promising young prospects in the minor leagues over the past few years, and he will be an exceptional talent at the major league level when given a realistic opportunity. Brewers fans: don’t fret. Help is on the way. Don’t get me wrong — Fielder is a once-in-a-lifetime-type player that will likely never be replicated anytime soon. However, the unwanted media attention No. 28 has brought is probably a bit too much for Roenicke’s liking (or mine, for that matter). By and large, the Brewers have never been a flashy, in-your-face type of organization (Tony La Russa may disagree, but that’s beside the point). They’ve come to be more known as a darkhorse/underdog type of team; probably because they’re MLB’s smallest TV market. Not to say that I don’t appreciate Fielder’s antics, but there’s no disputing how much redundant media attention Fielder has brought to the Brewers. Milwaukee’s rookie manager Ron Roenicke is a sure-fire candidate for NL manager of the year. Taking over a team that largely underachieved under Ken Macha each of the past two seasons (80-82 in 2009, 77-85 in 2010), Roenicke has incorporated his aggressive style of baseball into the Brewers this season. So far, it’s worked handsomely, with exception to Fielder. Roenicke pushes the limits of base-running on a regular basis, leading to a dramatic improvement in team stolen bases from last season to this season. Collectively, the Brewers stole 81 bases in 2010. In 2011, Milwaukee already has 88 — even with Fielder in the lineup. From a dynamic base-running standpoint, Fielder isn’t the typical athlete. With him out of the picture next season, the Brewers will be much more lethal on the bases. The Brewers are in the midst of what could become an all-time great season, but that doesn’t necessarily mean winning is the only thing on their minds. Clearly, Fielder’s free agency status has impacted everyone associated with the organization as a whole. That won’t be an issue in 2012.